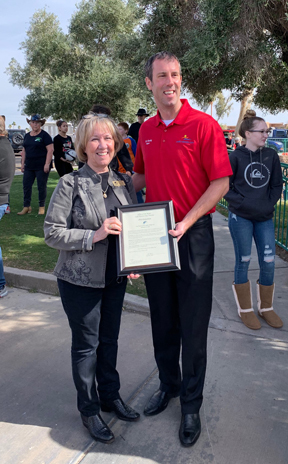 Mayor Cal Sheehy presented Linda Seaver, HCHF Executive Director with a Proclamation naming February 24, 2019 the Line Dance on London Bridge Day! The event was met with a sunny sky and (relatively) warm temperatures. Proceeds from the event support Havasu Community Health Foundation and help us continue the programs and services offered to the community. We want to say thank you to RiverScene Magazine and Jillian Danielson for covering the event. Check out the pictures and story at RiverScene.